When we bring consumer products into our homes and places of business, we expect them to function correctly and not pose an unreasonable risk of injury when used as intended. Unfortunately, this is not always the case, and each year thousands of people are injured by defective consumer products. The type of injuries that victims sustain depends largely on the type of product that caused the injury, and these injuries can range from mild to severe. In some cases, the injuries caused by a defective consumer product may even be fatal. As a result, it is extremely important that anyone who has been injured by a defective consumer product consult with an experienced Pittsburgh product liability lawyer as soon as possible. Cases based on defective product design – These types of claims arise when a product is inherently dangerous to use because of the way it is designed. Cases based on defective product manufacture – In this category of product liability claim, consumers have been injured by a product due to some defect in the way that it was manufactured. Cases based on a failure to warn consumers about non obvious risks – Also known as defective marketing claims, these cases arise where a product poses a risk that may not be obvious to consumers, which could easily be mitigated by providing a warning. Companies that design these and other products are well aware of their potential to cause injury, and have legal teams in place to defend against claims brought by companies. As a result, anyone injured by a consumer product should be certain to retain an attorney with a track record of success representing clients who are involved in these kinds of accidents. Individuals that have been injured by defectively designed, manufactured, or marketed consumer products may be entitled to significant compensation under Pennsylvania law. In addition, family members or loved ones of people who have lost their lives because of defective products may be able to bring a wrongful death claim to recover for their losses. 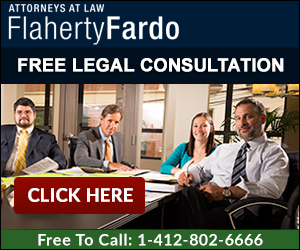 The Pittsburgh personal injury lawyers of Flaherty Fardo are dedicated to helping people who have suffered losses because of faulty consumer products get the compensation to which they are entitled. To schedule a free consultation with one of our attorneys, call our office today at 412-802-6666.